While at Focus On Farming, we attended a very informative session lead by Lindsey du Toit, Professor and Vegetable Seed Pathologist at WSU Northwestern Washington Research & Extension Center. She reviewed a few of the common diseases that occur on brassica crops in western Washington, including diagnosis, biology, epidemiology, and how to properly manage the crops if the disease is present. We took note on bacterial, fungal, and viral pathogens that occurred in the western Washington region. Below is a breakdown of what we learned and a few tips on how to manage various diseases. A disease is a disorder of structure or function in a human, animal, or plant, especially one that produces specific signs or symptoms or that affects a specific location and is not simply a direct result of physical injury. White mold: The fungus that causes white mold is Scletotinia Sclerotiorum and has the appearance of white, fluffy, cloud-like spores that appear on brassica plants. Its growth thrives in wet climates and grows quickly under extended periods of moisture. 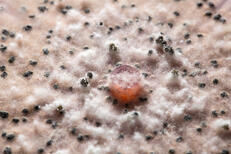 “Sclerotia” are the part of the white mold that stays in the soil. Sclerotia are said to look like black chunks that are often identified as “rat turds” and best germinate in the spring. The Sclerotia grow into Apothecia and sprout like a seed would. If you look more closely at the Apothecium, they have stalks, and each stalk has 8 spores which releases the disease. These spores can grow on both the vegetative portion and fruiting body of the plant. White mold (pictured left, and right) is a fast growing fungi that affects nearly 400 types of crops and plants and is more likely to grow on flowering plants with many leaves. It is not just a significant problem for brassicas in your vegetable rotation, look for it on legumes, cucurbits, alliums, lettuce, carrots and chicories as well. Clubroot: Also known as “Plasmodiophora Brassicae”, this fungal disease is soil borne and can be transferred by soil and moved by machinery, equipment, and water between fields. This disease thrives in moist environments and travels in areas prone to flooding. This disease causes the roots to abnormally swell, then spores are released into the soil and make their way to other roots in order to infect them as well. 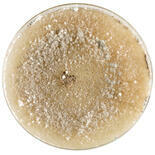 The spores can survive in the soil for nearly 20-30 years. 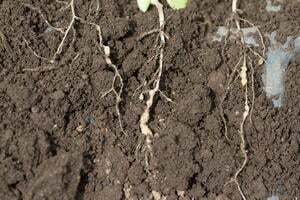 The swollen roots lose their ability to take up water and nutrients, so you may first notice Clubroot (pictured right) in the field as areas with small and wilting plants. This phenomenon is particularly common during times of dry weather followed by heavy rain or irrigation that cause the fungus to attack. Alternaria Leaf/Pod Spot: This disease thrives in warmer climates with more moist conditions. It can be identified as Leaf Spot (pictured below) by the dark/black spots that grow on the leaves and stems of the plants. be identified by the little black spores that eat away at the leaves and the black spots will resemble a torched piece of paper. The root will have little black pebble-like dots on them, as will the stem of the leaves. This disease is spread a number of ways or It can be seed borne. Its spores are also wind borne and waterborne, with wind and rain and splashing being prime modes of infection and travel. This disease ruins seeds and attacks seedlings by going after the bottom of the leaves and stems of the plants. White mold management: Here are some cultural practices to help prevent the growth of white mold in your fields. Utilize a crop rotation of non-hosts such as grasses and cereals to break the green bridge and limit Maintaining row orientation and adequate spacing to allow ventilation and increased air movement and removing your Brassica’s from potentially flooded areas is going to best prevent this fungi from growing. Osborne Quality Seed carries a variety of Cover Crops that can be used to aid in this type of management. Using mulches made of plastic and straw, and using conventional and organic fungicides can reduce the likelihood that White Mold will grow in your crops. Clubroot Management: In order to prevent the spread of Clubroot, it’s important to ensure that proper sanitation standards are met. Use new, and/or disinfected trays, clean water, clean equipment when moving between fields (pressure washing to remove soil), and use disinfectants. Be sure not to compost disease ridden plants. Soil and moisture are how the disease is spread, be mindful to not cross contaminate. More preventative care tips are to manage brassica weeds, avoid infested areas and fields, put crops on a long-term rotation (10+ years), maintain good soil drainage with raised beds and use agricultural limestone applications to raise the PH of the soil. You can treat the area with hot water treatments on rotation (122 degrees F for 20-30 minutes) but keep in mind that only some crops can withstand temperature changes to that degree.